Birds have captivated Rob Sawyer for almost 50 years. 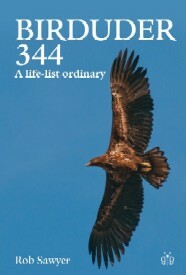 In Birduder 344 he tells of the highs and lows of his normally hopeless, but highly enjoyable, birdwatching career, sharing his great love of birds, and most things that fly, whilst trying to work out where he fits, if at all, on the birdwatching ladder. The text is illustrated with his own line drawings and photos of birds, and other entertaining images. White Stork, the first species I ever saw and clearly I would have had excellent views as I would have been practically touching it. But I jest, of course, as over 53 years later, White Stork is still not on my much-cherished ‘British life list’. I use a ‘freebie’ that was sent out to the subscribers of British Birds in 1984 and I still fill it in today, although I have a back-up spreadsheet of course. White Stork was once on the list, for a brief period of time, even if only for a few hours. Calling Birdline (an information service for birdwatchers) co-founder Richard Millington’s stentorian tones boomed Bittern like in 1996, telling me that there was one viewable from the golf course at Stanpit Marsh. Off I trotted, it wasn’t far, and sure enough there it was. Good views, even if the beak was not the scarlet it should have been, this was clearly a hungry White Stork judging by the mud that encrusted its enormous dagger-like bill. A ‘lifer’, (a bird you haven’t seen before, a ‘tick’). How fantastic and local also! Off I went back home to tell my wife all about it and to place a not so neat tick next to its name on my much loved list. Motivated by the lifer I had just seen, and just before I committed ink to list, I decided to get another dose of Millington and increase BT’s profits. The familiar, somewhat avuncular, RM then announced, to my horror, this magnificent bird had decided it didn’t like the surrounds of Bedfordshire and had escaped from Whipsnade Zoo where it had previously resided. The wind was incredible. The East Bank walk was very difficult with the wind at north north-east. But a sea watch with such a wind should prove interesting (how wrong one can be.). Arnold’s Marsh was sparsely covered with fairly prosaic waders and ducks: Bar Tailed Godwits, Redshanks, Spotted Redshanks, Ringed Plovers, Avocets, Dunlins, Gadwalls, Shelducks and Mallards. At the far end was an enormous number (150+) of Sandwich Terns. Strutting about, flying out to sea and generally being noisy, they made an entertaining sight. The difference (common to all terns) between their ungainly appearance on the ground and their almost perfect gracefulness in flight was incredible. Keeping its distance and being rather inert was a full summer plumaged Grey Plover. The stark contrast between upper and lower parts provided a beautiful sight. A shame that it was so far away. Something excellent happened in March. I got a new job so left the ‘job I hate’ in Waterlooville (just north of Farlington Marshes) to work and ultimately live, lucky me, just on the edge of the New Forest in a place called New Milton. I will start work on 4th May and therefore have a month left to work. Naturally it would be rude not to go and bid a fond (and it is a fond) farewell to my friends at the Admiralty who helped with projects, particularly the one that was adding to my life list. And for old times’ sake I managed a business trip to Portland and picked up three firsts – 1) an Iceland Gull at Radipole Lake – 2) a Whiskered Tern at Lodmoor – 3) it was the first time I had ever seen anything remotely interesting there! It’s 16th January and four of us are partaking in that quintessentially English pastime of Afternoon Tea provided by Mr T and his girlfriend. There is a slight issue because, inexplicably, scones have been substituted by toast – we’ve been robbed! But never mind, it’s nice and cosy and we’re reliving the trip we’ve just made to Portland Harbour. This is the first time we’ve really ventured out as a foursome, although Mr T and I have met at Stanpit a couple of times since the quiz but, apart from a very tan-coloured Song Thrush, we’ve not seen much. We did a tour of Portland Harbour and went somewhere I’d never been before which was good for two reasons. First we saw a Black Throated Diver, a pretty good bird to see any day, particularly in the harbour, but the most interesting things were the pieces of old Mulberry Harbour from the D-Day landings. It seems incredible that such a huge piece of concrete actually floats. Birdwatching aside, it’s worth going to look at these leviathans of history from not that long ago. A great feat of engineering. Happy New Year! I’m not too drunk, or certainly not by the afternoon when I give the rare bird websites a cursory look. Or am I? Am I seeing things? Some 20 days after it was last seen the White Tailed Eagle has reappeared. It’s still in Hampshire, very close in fact to where I used to live, as it’s been seen in the New Milton and Hordle area. Gosh, after it’s initial fleet wingedness, at some 30km/h or more, it really slowed down – to about 1.5km per day. It must have walked, or celebrated the Christmas period to the extent it was unable to move around. Or perhaps it did a detour before it arrived here, in west Hampshire, from its previous location. Or perhaps it’s been here and has gone undetected. Well, considering it was seen three times in just over half an hour back in December, stealth doesn’t seem to be one of its skills. Perhaps it’s been here and somebody has seen it but doesn’t know what it is. Or perhaps someone has seen it, does know what it is and hasn’t told anyone. The bird shares something in common with the Winchester White Throated Sparrow – yes that’s right, it’s got ‘white’ in its name. It also shares the accolade of having been suppressed.